Here is an update on a new venture that we started a couple of weeks ago called “Cuppa and Chat”. 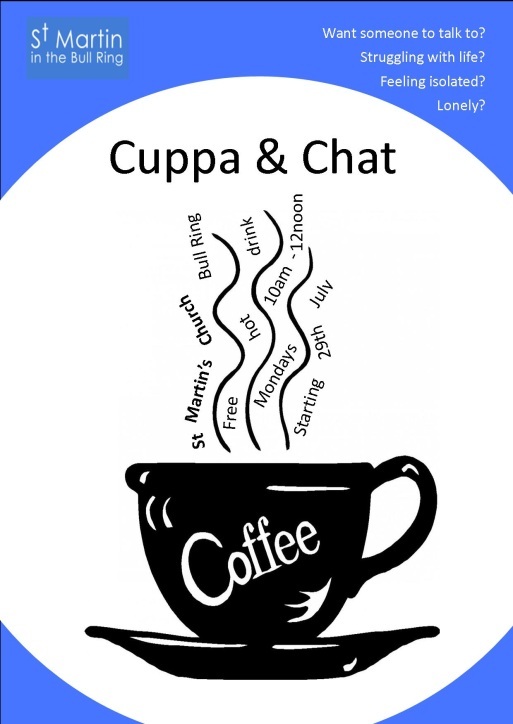 This is a coffee morning held in the church every Monday from 10am-12pm for people that might be feeling isolated, lonely, struggling with life and need someone to talk to. So far we have made contact with 40 or so different people over the two weeks with many people from all walks of life coming to sit down and enjoy a free hot drink and an opportunity to have someone listen to them talk if that is what they want. The majority of the people we have seen have various practical needs however have mentioned that what they most need is someone to talk to about aspects of their life that are hard. We have the privilege at St Martins of giving our time to helping these people and hopefully seeing change begin to happen in their lives. We pray that God will continue to bring people along and that we can love them as Jesus would. If you would like any more information about this or think that you would like to volunteer in this area of church work then please contact joy@bullring.org.